Open in March 2011 we have a 3.5 acre lake, with an average depth of 7 feet. There are two double swims and a single swim; there is one large timber gazebo with electric points (for use of bait boat batteries, mobile phones, and small voltage electrical items) bench table, cooking area, to share. Like Napoleon 1 each swim has its own weigh station consisting of weigh post, weigh sling, euro unhooking mat, push bike for toilet and bait runs. Fish stock consists of 2.25 tonne of Royal Strain Carp up to 48lb, stocked with lots of 20’s and 30’s, plus unknown original stock, making it a perfect runs water. A new stock of 40 fish were added in 2012, 30 more fish in 2013 and 60 more in 2014. If you fancy a break from the rods/hauling there is also a large timber constructed gazebo situated between the two lakes complete with BBQ area for the ideal holiday get together social. 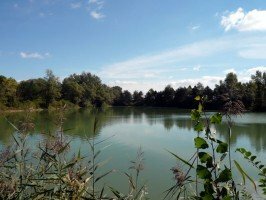 Here at Napoleon Lakes we have bait boats for hire, plus food and bait packages, which are also available upon request via our booking page or e-mail us for more information.